With elderly Victorians currently equating for 15 per cent of the state’s population, the need for discussions around the emotional, physical and financial challenges associated with ageing are increasing. To help residents navigate the ageing minefield, a free information seminar will take place on Monday 4 May at Sandringham Yacht Club from 2pm. 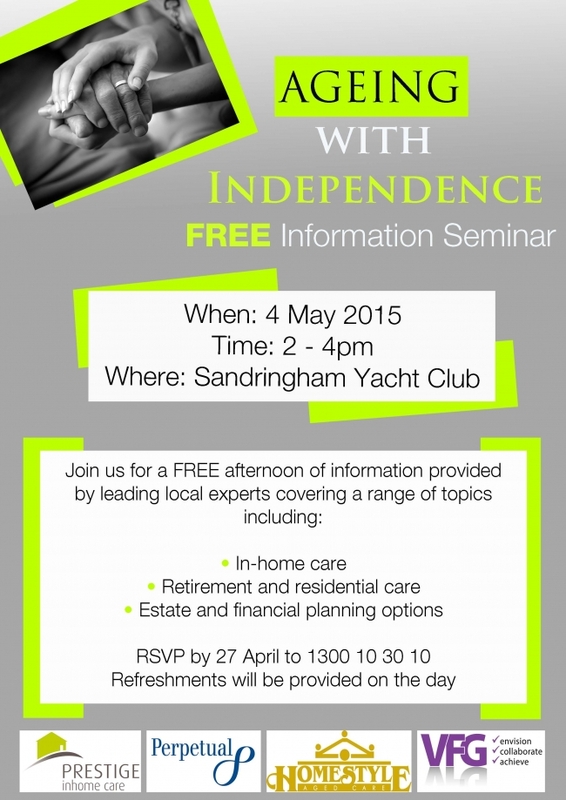 Hosted by Prestige Inhome Care, the two-hour seminar, aptly titled ‘Ageing with Independence’, aims to arm event attendees with expert knowledge across the aged care, legal and financial industries so Victorians can make educated decisions for the future whilst maintaining their independence. Featuring guest speakers including Prestige Inhome Care CEO Nick McDonald and Vista Financial Group Financial Planner Sonia Dallimore, the seminar is open to elderly residents and their families or those wanting to know more about how to tackle the ageing process. Tea, coffee and refreshments will be provided after the seminar. A full list of the guest speakers, their professional backgrounds and their agendas for the seminar has been included below. Registered Nurse and Founder of Prestige Inhome Care Nick McDonald has over 20 years’ experience in the aged care sector and will discuss the availability and accessibility of inhome care services. Prestige has offices across Victoria including a head office in Cheltenham. CEO of Homestyle Aged Care Tim Humphries has over 12 years’ health experience and runs a privately owned residential aged care provider which currently cares for over 800 elderly Victorians. Tim will discuss the benefits of retirement villages and nursing homes for older residents. John is a respected, long-term member of the Perpetual legal team and has worked on a broad range of legal support activities including overseeing asset transactions and managing medical and general insurance claims. John will discuss estate planning and the process of power of attorneys. Expert financial planner at Vista Financial Group in Sandringham, Sonia Dallimore, specialises in the provision of aged care financial advice and will discuss government packages, bonds and aged care placement. This free, community seminar is a great way for elderly Victorians to understand the legal, financial and aged care services industries and will help seminar attendees make the most informed decisions for their future.